Science topics and genetics research are reader favorites, especially women with alopecia areata. 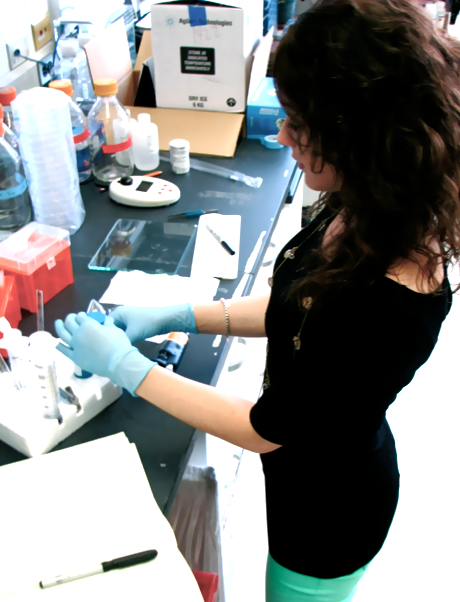 This week, we continue with part two of our interview with Gina DeStefano, PhD candidate in Genetics and Development at Columbia University. 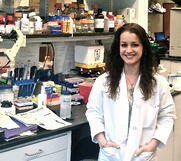 Perhaps Gina’s story will influence a young woman you know to be a genetic researcher, too. Last week, Gina shared her passion for science and genetics and told us about the important people who influenced her along the way. Fast forward to her busy life now as a 5th year PhD candidate. Gina shared with us that genetics not only can be fun work, it can also be amusing! Thea: Are there other “women in science” among your family and friends. Gina: Yes, definitely. I’m the first scientist in my family but I’ve got lots of friends and colleagues who are women in science. Over the past few years, I’ve become an active part of Women in Science at Columbia (WISC), an organization dedicated to the advancement of women and underrepresented groups in the STEM (Science, Technology, Engineering and Mathematics) fields. We host many events that provide opportunities for professional development, networking and mentoring. Recently in collaboration with my fellow peers, I started two new events for professional development. The first is “Ask a Professional”, which is a discussion-based series for PhD students interested in exploring careers outside academia. The series features successful women in such fields as industry, science writing, science publishing, consulting and science policy, The second event is “Women Who Code,” an exciting informational workshop taught by a CUMC computational biologist and designed for students and postdocs interested in learning more about bioinformatics/computational biology and the applications for biomedical research, like analyzing large data sets. Thea: Did your current career path to the lab and Dr. Angela Christiano research projects come from a specific interest in her work or more generally in genetics and skin disease? Definitely a combination of the above. When I came to work in the lab, it was my first exposure to skin and hair research, and this was really a great opportunity to learn a whole new field. The lab studies not only the genetic basis of inherited skin and hair disorders, but also uses the skin and hair follicle as tools to do genetics. This provides a great system to address questions about which genes are important for controlling hair follicle growth, and of course general biological properties of hair follicle cells like how they behave, proliferate, differentiate, and communicate with the surrounding cells. Thea: For us non-scientists, tell us more about genetics and skin. In the time that I’ve been in the lab, I have come to love working on the skin and hair follicle not only because the biology and genetics are quite complex, but also because these tissues are readily accessible and easy to obtain. Interestingly, a lot of what we know about how hair growth is regulated and what genes are involved comes from studies in mouse models, some of which actually mimic human genetic disease. Genetics can be fun, and also quite amusing… if you want a good laugh, go do a quick Google Image search for “angora.” This represents a naturally occurring mutation in a gene called FGF5 that is really important for regulating how long hair follicles can grow. Mutations in this gene have been identified in mice, rabbits, cats, goats, sheep, and now humans (a study we recently published). Really cool! It’s amazing to be in an environment with the right tools and resources to drive the development of therapeutic interventions for conditions like alopecia areata. Thea: What's a typical day like for you in the lab? An average day consists of several hours of bench work (experiments), preparing and planning for my next experiments, and analyzing data. In between experiments, I read papers to keep up with the literature and when applicable, spend time working on writing assignments. In research, the hours you work can be quite random and some days require more time in the lab than others, depending on the tasks. Often times, experiments don’t work and you spend a lot of time trying to understand why. So taking this into account, I do my best to structure my days, work efficiently, and achieve maximal productivity. We hope you enjoyed hearing about Gina’s career and join us in wishing her continued success! Please add your comments below.